In a choice between being overrated or being underrated, I would have to go with the latter. You're almost always in a better position exceeding people's expectations than failing to meet them. (I suppose it's better that most of us fall somewhere towards one of the extreme's on this scale; everyone being rated exactly correctly would either result in a sparkling utopia--which would be utterly boring--or an inescapable dystopia--which would be horrifying.) One of the actors at the top of that list for me has always been Miguel Ferrer, whose performances for me always left a lasting impression. Unfortunately, the word was deprived of his gifts as of Thursday, January 19, 2017 as Ferrer died after a battle with throat cancer. I refer to Ferrer as underrated as the highest compliment; I never felt he really got his due in Hollywood. For me, seeing his name attached to anything was always a selling point. He appeared on my radar at an early age, as he appeared in my introduction to R-Rated films and Paul Verhoeven's genius as Bob Morton, the guy who created Robocop in the movie of the same name. In addition to acting next to a man in an aluminum suit (and sometimes not wearing pants) pretending to be a cyborg, he also had to hold his own against archetypal 80s bad guy and occasional Starfleet Captain, Ronnie Cox, which he did beautifully. In a decades-long career that included role in some of my favourite franchises such as Star Trek and Adventure Time, my other favourite Miguel Ferrer role was as Lloyd Henreid in the Steven King miniseries The Stand. For me, this was another role that that really cemented Miguel Ferrer as a singular talent. Lloyd was a criminal who ends up literally serving the Prince of Darkness (all due respect to Alice Cooper). But there was a vulnerability that Ferrer brought to the performance as well, as the character had a code of loyalty and honour that made him more well-rounded than villains in most Hollywood blockbusters today. (Looking at you, Marvel, though maybe not the best comparison because Ferrer did play the villainous Vice-President in Iron Man 3...). There was something compelling to me about his voice, all gravelly and baritone. I could listen to that man talk for hours. 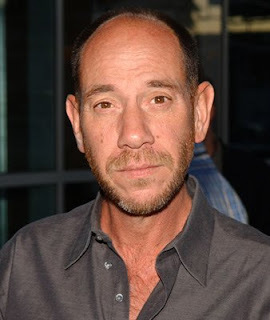 Today history will mark giant changes in our world, and lost to most will be that on the same day Miguel Ferrer lost his battle to throat cancer. But not lost to his family. Miguel made the world brighter and funnier, and his passing is felt so deeply in our family that events of the day, (monumental events), pale in comparison. We love you Miguel. We always will. So say we all. RIP Miguel Ferrer.